By: Mona Swarup, Krishna Devotee. 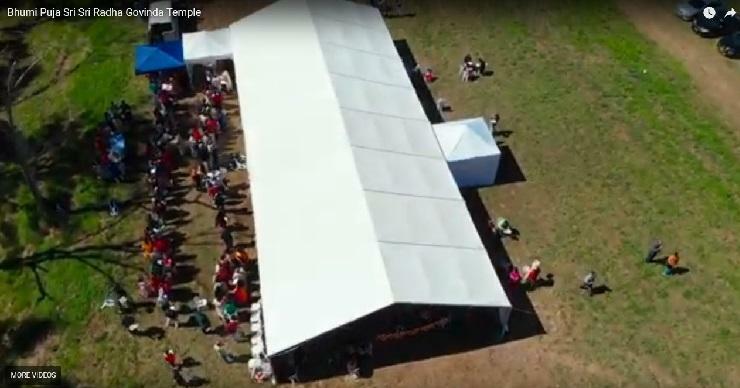 The grassland site at 217 Windsor Road, Vineyard was buzzing with activity since 8.00am on Sunday 31st March 2019. A team of enthusiastic devotees added final touches to the Bhumi Puja celebrations that were to commence in couple of hours. A huge white marquee was set up with chairs and stage for the fire yagna (sacrifice). It was a perfect Sunday weather with sunshine and blue skies for Sydney. The day began with the arrival of Srila Prabhupada and he was welcomed with chanting of the ‘Hare Krishna maha mantra’ by the devotees. 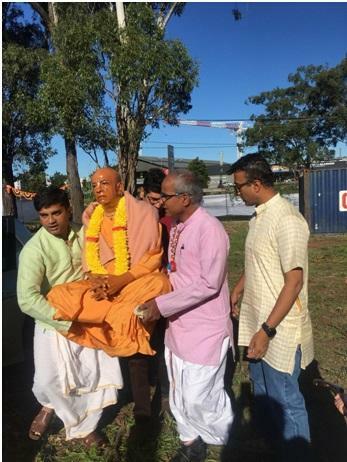 Srila Prabhupada was placed on the stage and all devotees prayed for his blessings for a very important milestone in the construction of the Hare Krishna Community and Cultural Centre. The ceremony commenced with a beautiful kirtan with sounds of kartals, mridanga and harmonium. The sound of divine music and kirtan spread throughout the area. Soon the marquee was bustling with sounds of eager attendees who had come to be part of this once in a lifetime opportunity. There was a sense of excitement and eagerness in all present at the ceremony. Meditating on the words of Srila Prabhupad, “If you build a temple of Lord Krishna in this world, He will build a palace for you in the spiritual world- Vaikuntha”, a flower offering was made as part of the Guru Puja. The next part of the ceremony officially welcomed prominent community leaders – A message from Michelle Rowland, Shadow Minister for Communications, Pallavi Sinha – a lawyer and academic and a voice for women empowerment – Liberal candidate for NSW Upper House in state election, Raj Datta – Councillor for Strathfield, Surinder Jain – National Vice President – Hindu Council of Australia and Suresh Khatav and his wife Mrs Chaya Khatav – Founders of Spirit of India . A fire yagna was performed to seek blessings and forgiveness from mother earth prior to the construction process. The yagna and sounds of vedic mantras were followed by the installation of Ananta Shesha. Ananta (which means unlimited) has the entire material world on his hoods. There is no end to His strength as he holds the entire universe. 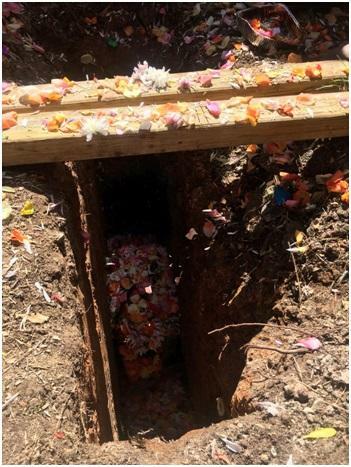 He was installed in a pit with eternal wishes, flowers and auspicious paraphernalia. The blissful gathering cheered with loud chants of “Hare Krishna!” and the atmosphere vibrated with divine sounds. The ceremony concluded with a generous prasadam feast for all attendees. Every attendee experienced transcendental bliss and bhakti for being part of an auspicious Bhumi Puja ceremony. The project team looks forward to an exciting new phase to see the manifestation of the structure. 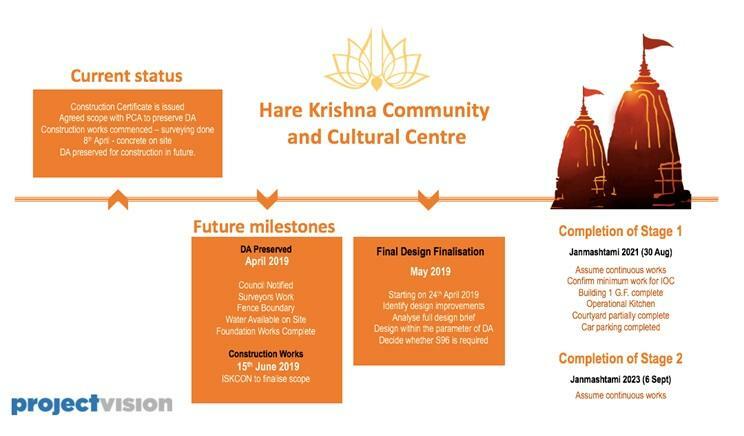 The Hare Krishna Community and Cultural Centre project is not just a building or structure. It is a sublime effort that will not only help the current community but will also benefit future generations.